Milani Cosmetics gives a new meaning to summer-streaked hair. Paint your hair from tip to tip with Milani’s Limited Edition Product--- Color Streaks. Adding a fun pop of color and sparkle to your hair has never been so easy. With five exciting colors, Color Streaks will take your hair from boring to bold in a flash! 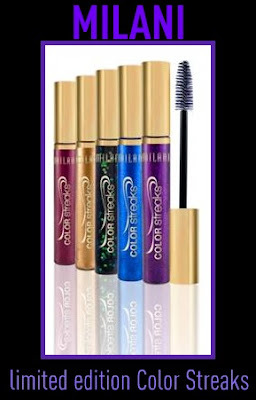 The mascara-like precision applicator gives you desired color where you want it in less than 30 seconds and then simply wash it out and start again! *Contains Keratin, which helps rebuild and restore hair. Limited Edition Product Available ONLY the month of JULY at select CVS drugstores. For additional information, please visit www.MilaniCosmetics.com. I have short hair and I think I totally would be into this!! Totally will be getting this. I had been using my LA Splash liquid liners with a disposable mascara wand to do just what these do. These will make it so much easier. I might just get this. I'll attempt this after I cut my hair.